This is the email received by InterMoor’s Global President Tom Fulton last week after the company just completed the replacement of nine (9) mooring lines on an FPSO offshore West Africa. The project is yet another one to add to the long list of mooring system integrity management / mooring line inspection and repair jobs that InterMoor has performed over the years. – During the work, the FPSO remained connected and in service. – The project was completed ahead of schedule, with no incidents or accidents. InterMoor provided project management, engineering, procurement, procedure development and offshore labor. 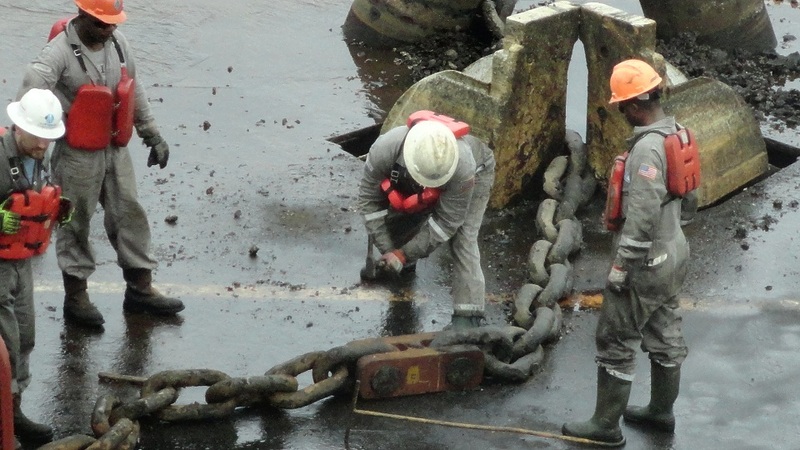 The mooring line replacement work included recovery and disconnection of the chain, inspection of the existing chain, removal of any non-conforming chain, replacement with new chain, and reconnection to the FPSO. The pull-in wire was also replaced by InterMoor prior to the operations. InterMoor provided a crew of 26, split between the AHV and the FPSO, including offshore engineers, rig coordinators, offshore construction managers, riggers, and welders. In total 1954 m (6,410 ft.) of chain were replaced and reconnected, roughly the height of 6 Eiffel Towers. Similar services were provided last year for Zafiro Producer (EG): Replacement of old mooring chains and wire ropes for 9 of the 12 mooring lines along with 2 drag anchors.